Mr. Chirico is an internationally known painter and muralist whose works are on display in private collections in England, France, and Germany as well as in the United States. 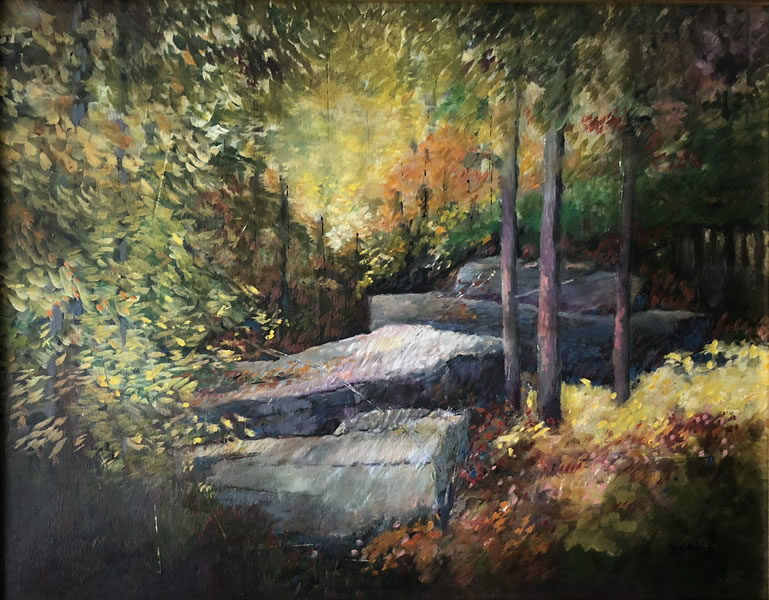 Maintaining a studio and residence in the town of Hunter, he has turned his fine eye to capturing the beauty of the landscape in the Catskill Mountain Region. Using delicate, vibrating colors and a masterful technique, the paintings show a strong contrast of approaches to the landscape. Born in New York in 1933 and raised in Brooklyn the late Guy Chirico attended Pratt Institute, the Phoenix School of Art and the Art Students League. After graduating from Pratt, he worked as a freelance artist/illustrator and graphic designer in the 1950’s and 60’s for hotels and restaurants, including the Russian Tea Room and Tavern on the Green. He also created mural works for Pam American Airlines. Much of his work throughout his career was in the Hudson River School style with his oil paintings capturing the drama of nature and the landscape. He continued to paint reflective of the Ashcan School movement, and rendering European cityscapes, and later trompe l’oeil and portraits. Chirico was an internationally known painter and muralist whose works are on display in private collections in England, France and Spain as well as the United States. His work was the subject of a major retrospective in 1997 at the Galerie Etienne De’Causans in Paris, France and his landscapes were exhibited at the Musee Fleury in Lodve, France. In 1966 Guy Chirico founded the Scribner Hollow Lodge and became a master of hospitality. Maintaining a studio and residence in the town of Hunter, he turned his fine eye to capturing the beauty of the landscape in the Catskill Mountain Region. Much of his work was inspired by the views out his studio window on the play of light on ancient rocks. Using delicate, vibrating colors and a masterful technique, the paintings show a strong contrast of approaches to the landscape. Chirico was constantly experimenting and growing as a painter, and this retrospective is the culmination of a life of art. In addition to his career in art, Chirico served as President of the Greene County Council on the Arts, as a Board Member of the Friends of Olana and was a Director Emeritus of Columbia-Greene Community College Foundation. He died in 2005.